Every mom I know is nearly surgically attached to her cell phone, and usually for good reason. She wants to know where every member of her family is at any given moment, and if you’ve ever experienced not being able to get in touch with a child or spouse, you know how scary it can be. Well, imagine a time when virtually all communication is shut down and you’ll know why huge numbers of Americans are getting their amateur (ham) radio licenses. Not knowing where a family member is is bad enough, but not knowing what is going on outside your own neighborhood would be terrifying. As Master Po describes in this article, becoming a licensed operator isn’t particularly difficult. Even 11 and 12 year-old kids have passed the exam, so if they can do it, so can you! Read Po’s article to get a good overview of amateur radio and the steps involved in getting your license. If you’re a self-starter and learn best on your own, begin studying online, check out a study book from the library, or buy one. Check ARRL’s schedule of classes here to find one in your area if you learn best in a classroom setting. Set a deadline for finishing your study and taking the test. Become familiar with how amateur radio operates by listening in via a shortwave radio, also here. Find a club in your area. You’ll learn more than you ever wanted to know about amateur radio. Trust me! Once you get your license, there’s no need to break the bank with your radio purchase. One long-time operator suggested buying online from Ham Radio Outlet. A ‘Made in China’ model, costing around $100 or so, is a great place to start. If you have questions about this skill, post them here, and Master Po or another ham operator will answer them. Good luck, and when you pass the test, post your call sign here! At end of your article, I think you are probably referring to the Wouxun KG-UV2D HT (handheld transceiver). I own an earlier model of the same radio and have been very pleased with it. I would recommend http://www.wouxun.us if you are looking to purchase one. Ed is a US ham and has been selling these for a long time now. Both of these radios would primarily be used in conjunction with repeaters (basically a more powerful radio in a good/high location with a big antenna that "repeats" transmissions from the smaller radios) or with other line-of-sight transmissions. The HF (high frequency) radios are a different beast and are more commonly used in long distance communication. As for the test, I found the practice tests at http://www.qrz.com/ht/ to be very helpful. You need to learn the material, but these practice exams can take a lot of the anxiety out of test day. Already ahead on this one, earned my Extra back in October. 🙂 Love seeing ham radio promoted. There's so much to it as a hobby, let alone the emergence communications aspect, that I wish more people would get involved. whatever you do, don't be a paper ham. If we don't use our spectrum then they will take it away. So get out there and have fun actually using your license, otherwise there won't be any spectrum to use if SHTF! (Also, log any and all public service so the FCC knows the spectrum is being put to good use). For about $160 you can get a Yaesu FT-2900R, a 2 meter radio that has consistently gotten good reviews and is recommended by our Emergency Management Agency here in Franklin County, Missouri. It has lots of bells and whistles, all of which are easy to use, it's built to military spec and it also offers 75 watts of power, just in case. It's what I bought and so far I'm absolutely amazed at just how far away I'm receiving from, well over 20-30 miles in simplex (I live way up on a high ridge which helps a lot). As soon as the FCC publishes my call sign I'll get to see how well it transmits. I can use it either in my truck our in my house, with the addition of a power converter which will cost another $150 or so. I'm using a Hustler MX-2 mag mount antenna ($35) on the truck and I'll build an antenna for the house. Anyway, for under $200 you can have a functioning radio up and running, one that is well built and well designed. No need to buy the cheapest when a few dollars more can get you a solid rig. I’ve got a FT-2900R in my car, with a NMO roof mount Larson NMO-150 5/8 wave, and lemme tell ya…it gets out GREAT. Even before I had the antenna on the car, I had fabricated a 1/4 wave ground-plane out of some spare wire and some wood for support, and with just the radio and my homemade antenna, I was hitting a repeater about 80 miles away from my house on 10 watts power (with a LOT of buildings in the way between here and there). I ended talking with a guy over the repeater who lived right down the street from me, and he said I was coming in clear and strong. So yeah, great radio, haven’t had any problems with it. Highly recommended! This is great timing. I've wanted to learn ham radio for awhile, but didn't know where or how to start. I discovered there is a club right in my town! I'm in for this skill of the month but I have a thought, question really. 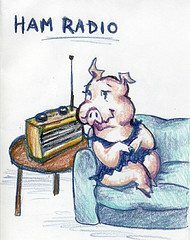 With all the talk lately about EMP's how would they effect a ham radio? Or better yet, how would I go about protecting my system (after I get to that point of course)? Older radio units that have vacuum tubes will survive an EMP, or so I've been told by a long-time ham operator. On the questions about an EMP the older a unit is the better the chance the unit has of surviving an EMP, unless it is MIL SPEC, many of the MIL SPEC have extra shielding to protect them. An EMP puts out a tremendous amount of energy similar to a static charge which can overload and burn out the new micro circuitry in the new units, the older units used much more power to do the same thing, and the components were designed to handle higher currents and voltages, therefore having a better survivability in the case of an EMP. Just remember the more bells and whistles the unit has the more that there is that can go wrong when an EMP happens sometimes an old Plain Jane unit is much better, less to go wrong with it. Your comment about tube equipment surviving an EMP is correct as far as it goes. Nothing will survive all EMP’s but they are more likely to be useable than Slid state rigs. I suggest using them once a month to keep them in good condition then, put them away for later. If they are not connected electrally to the outside world they are still more likely to survive. I have been active with Ham radio for a couple of years now, currently holding a General class license. I will be using this skill as motivation to move up, however having completed the process more recently I thought I would offer some insight, and some "treats" to help encourage others. Now for the "treat" Like Lisa said, what survival mom, or dad isn't interested in knowing where their family is at all times! One capability that you can employ with amateur radio is called APRS (Automatic Packet Reporting System) when connected to a GPS unit this serves to transmit your location over the APRS network. (This can be double edged I will admit.) So, if the Paranoid Dad is at work, and Survival Mom at home when a tornado hits. Phone lines are out, but she can see on her display that he is on his way home, she can focus her attention on the kids and the house! Just remember that anyone else with the same equipment can also see your position. Now I will close with a word of caution. Guard your Call Sign when you receive it! Because you will be licensed through the FCC, anyone can go and look-up your permanent address in the FCC database. You don't have to list all your addresses, so if you have a bug out location, this may not be as great a concern, however, it is something that I don't think is clearly understood, nor told before you get the license. I sincerely hope this does not discourage anyone from getting started in Amateur Radio, just a tactical concern. If any one has questions, I will continue to monitor this thread, and offer my insight. Also check out this site for hand held ham radios. They sell two very good inexpensive radios. You can buy them BEFORE you get licensed (just don’t transmit) so you can start listening to your local hams. My family has been in the HAM Radio community for the last 15 years and I have learned a lot in that time. Yes, the older models of radios with tubes in them are not going to be affected by any EMPs because they are not electronic. Just as older-model cars that do not have electronic starters will still run). The newer radios do have electronic components, but can be safely stored in what’s known as a Farraday Cage. This is a metal container ( like a metal trash can or metal file box that is is lined with styrofoam as an insulator against any magnetic impulses. If you store the radios in something as simple as this, you should be able to have you radio communications when others do not. It’s always good to look up the Farraday Cage and other ideas online or contact your local HAM radio group in the community. They have all kinds of helpful tips….just like this group!!! Someone suggested to me if you have a difficult time studying for test. Get the book, mark off all the incorrect answers so you will only remember the correct answer associated with the question. Never tried it but makes sense. Gordon West Technician Hand Book. Read through completely 5 times and only the right answers. There is a paragraph at the end of each question that says Why it is the right answer. Take the test and you will pass. I live in the Provo UT area, where the LDS (Mormon) Church is pushing everyone to get their Technician license for SHTF scenarios. I expect there will be major traffic jams on the radio due to many people having radios when everything falls apart. That’s the nice things about ham radios, there really cannot be traffic jams with thousands of frequencies available. True, people like to use only certain freqs (as we call them), but in case of an Armageddon, there will be lots of frequencies to choose from. Just enrolled myself and the hubby in a HAM radio course. He’s an EMT and it will be helpful for his job and I thought it would be nice for both of us to know. Enjoying it so far! I am an Amateur Extra operator and a Volunteer examiner. I went from zero to top of the food pyramid in only six months. It is easy, fun, and you can help save lives while you are at it. I started a club at my school where I teach and I have had several students licensed now and we now have our own repeater which was donated in its entirety (antenna, poles, cables, machine, connectors, etc) by many hams across the nation. Ham Radio is more than a survival skill, it is a community ready to step in when called upon; we are there to make long-lasting, worldwide (and local) friends, and we are proud to wear our call sign and sometimes use it as our only name. Glad to hear that you’re helping your students get into our wonderful hobby! Nice bike btw…love the color. I really miss riding motorcycles. Good luck to ya down there in Texas! 2. Totally agree with the subject here…get your ham radio license. I went from zero to Amateur Extra in 2 weeks (ok, yeah, I have some background in electronics…but my secret was simply memorizing the Q&As for the test, and occasionally looking up something that I didn’t quite understand (like Smith charts). 3. A Technician class license will give you privileges on the VHF & UHF bands, which are very useful for local communications. 4. A little talked about method, that uses the HF bands, is called NVIS (Near Vertical Incidence Skywave). It is used to communicate within a 300-500 mile radius from your location by bouncing radio waves off the atmosphere. HF is normally used for long-distance communications by skipping the radio waves off the atmosphere. NVIS is similar, but instead of aiming your antennas at a low angle, you aim them straight up (vertical), and the signal comes back down in a ‘cone’ fashion…imagine an umbrella (or to be technical, the takeoff angle is as close to 90 degrees as possible.) The antennas for NVIS are normally quite short, and easy to set up and use. One of the benefits of NVIS is that you can use it to communicate even when you’re in a deep valley surrounded by mountains, as line-of-sight does not matter with this method (as it does with VHF & UHF). 5. Go ahead, get that license…it’s not as hard as you think! Get yourself a PO Box, or private mailbox because all amateur radio licenses can be looked up online, and the FCC website does show your mailing address (for example, I once spotted someone with an amateur radio call sign license plate, and it took me a grand total of about 2 minutes to find out what the person’s name was, but also his mailing address (appeared to be a residence), and his phone number (which you are not required to provide by the way). (a side note: for more information on personal privacy, please read one of the BEST books on the subject, “How To Be Invisible” by JJ Luna, or check out his website jjluna.com . He has a free report on how & why you should not give out your home address on his website. I have my license. Have had it for 6 years now. I need to upgrade to General Class, I just hadn’t had time and I need to get a new atenna for the car. I’m also trying to get the kids to take the test so there is someone else in the house with the license. I am just beginning to explore getting my license. Have a friend who provided me w/AARL book, up to date, have one year to take exam before questions change. Am exploring local club. Wondering about best place to explore equipment? Would like an older setup that would survive EMP. Cost is a concern. Aside from local club, any suggestions on where to look for equipment? Emergency Communications Resource and Network of preppers: http://www.amrron.com Thanks for the article on Ham Radio! Ham Radio for Preppers by Kent Hertz is great resource for those looking to improve their comms.